Your feet are emitting moisture which is absorbed and stored by the shoes. Only by daily change the shoes are able to dry completely. The upper leather will keep its desired properties for a significantly longer time. Insoles help to prolong the lifetime of your shoes by absorbing foot moisture additionally. Remove them always for drying and ventilation. Leather folds can be avoided by putting your shoes after wear on a shoetree. Besides, the shoes are drying more easily. If you do not wear shoes for a longer time you should put them on a shoetree at any case. Wet shoes may not be dried too close to the heating. The leather would dry too fast and would become hard and cracked easily. First of all, wipe the shoes with a damp cloth and rub it dry afterwards. Best would be to fill the shoes with newspaper. Shoes with a leather sole should point to the top when drying. 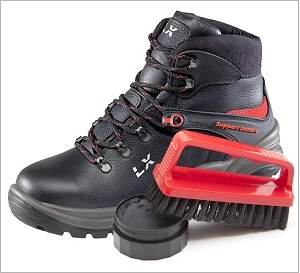 Principally avoid to press too strong when cleaning the shoe. Most of the shoes are treated with surface colours which may be rubbed away. In case of practical leather you may use older household remedies. Try for example vinegar water in case of salt stains and paraffin oil in case of snow or water rings. Apply shoe care agents always in a thin and even layer. The simple rule “less is more” is valid. Pay attention to the right choice of the agent. Fine leather could be spoiled due to wrong shoe care agents. Before wearing your shoes for the first time, you should basically treat them with a care agent and impregnate them in order to protect them against dirt and moisture. Best would be to impregnate your shoes regularly after cleaning and creaming. During winter when there is rain or snow once a week. Clean shoes out of smooth leather regularly with a colour corresponding emulsion cream and polish them with a smooth cloth afterwards. Brush shoes out of velour leather with a rubber brush. Fresh them up with a liquid colour velour care.